Now that I'm eating low carb, pecans are my new best friend. Pecans are very keto friendly because they have some of the lowest carb counts of all nuts. So, I knew I had to create a keto chocolate pecan pie for my Thanksgiving Meal Plan because chocolate and pecans are totally best friends, am I right? 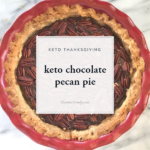 Not only does this pie bring creamy dark chocolate filling together with the taste of toasted crunchy pecans; but a slice contains just 9 total carbs per slice with 4 grams of fiber. Compare that with a traditional pecan pie that contains almost twice the calories and 65 grams of carbohydrates per slice! That's just crazy town! Isn't it great to know that you can still enjoy this sweet and yummy dessert without sabotaging your health & nutrition goals? 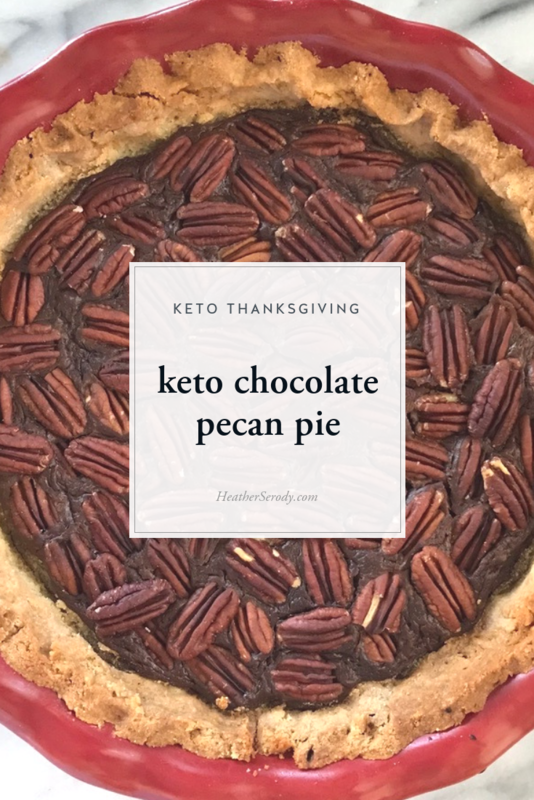 I tested my ketones and blood sugar the morning after eating this pie and I was still in ketosis and my blood sugars were on point. Of course, all pies are calorie dense, so portion control is key, make sure you cut this pie into 12 slices. In fact, I just decided that after I'm done with the cooking for 25 for Thanksgiving this year, I'm going to partake of a piece of my chocolate pecan pie while watching When Harry Met Sally. It's gonna be so great. Decadent desserts don't just magically become low-carb, you need to make sure you have on hand a few special ingredients, mmm'kay? Because there is no wheat flour in this crust you'll need to be sure and use xanthan gum, which will help your keto crust hold together. Don't wait until the last minute to order these, grasshopper! You can make the dough and store in the refrigerator up to two days ahead of baking your pie. Nutrition information is for 1/12 pie. Lightly butter a 9-inch pie dish. In a food processor, pulse together the flours, salt, & xanthin gum to combine. Add chilled cubed butter, and pulse about 20 times or until pie crust resembles small balls. Add egg yolks and pulse about 20 times until the dough just comes together in a ball. It should be moist enough to hold together, but not wet. Gather the dough into a ball, then lightly flatten into a disk with the heel of your hand. *At this point you may store the dough covered tightly with plastic wrap, refrigerated, for up to 2 days prior to baking your pie. Lightly flour a clean cold surface and the top of your dough with almond flour. Working quickly, LIGHTLY press out the dough with your hands to about a 6-inch circle. Transfer the crust to your buttered 9-inch pie plate. Using clean hands, press the dough out evenly using the palm of your hand, not your fingers, into your pie pan and up the sides. If your pie pan is large/tall the dough may not reach over the edge. This is fine. Be sure the bottom of the dough is even. You may crimp the top of the crust with your fingers to make a fluted edge. Bake for 15 minutes, or until pale golden brown on the bottom and the top of the crust is just starting to brown. Remove from oven. Spread pecans on a rimmed baking sheet. Toast nuts, shaking pan occasionally, until fragrant, about 8 to 10 minutes. Remove from oven and set aside. In a small saucepan over low heat, melt butter and chopped chocolate, whisking until smooth. Add cacao powder, and whisk again until it is smooth with no lumps. Remove from heat and set aside. In a large bowl, whisk together the eggs, Swerve, Yacon syrup, liquid stevia, & salt. Add chocolate-butter mixture and vanilla & whisk until smooth. Pour the mixture into the prebaked crust. It will not come all the way to the top. This is fine, it will rise as you add the pecans. Arrange pecans nice side facing up, over the chocolate filling in one layer. Then add another layer on top. 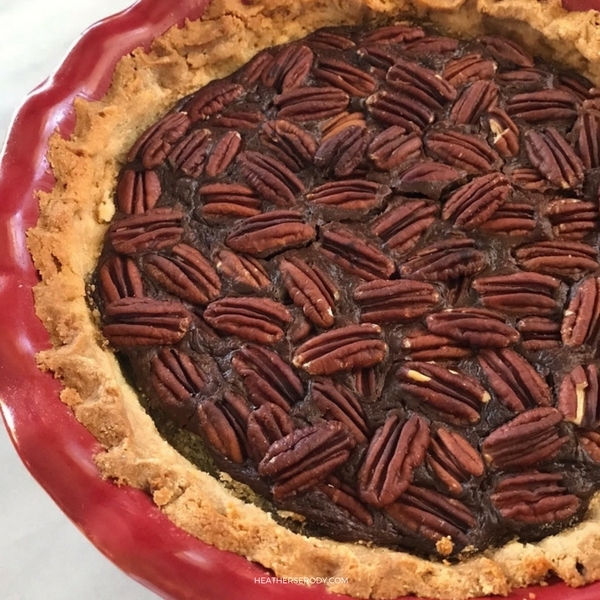 You may lightly press the pecans down into the chocolate filling, so that all the pecans are nestled into the filling, but not submerged. Transfer the pie to a large rimmed baking sheet to catch any spills, and bake until the filling is set about 30 minutes. It is done if when you jiggle the pan the filling doesn't move too much, but a little bit is ok okay. If it shakes a lot, cover your pie loosely with foil and bake for an additional 10-20 minutes or until just barely jiggly. The filling will continue to set as it cools. Note: while baking, the filling may crack & puff up a bit, but it will lay back down as it cools. If you don't want your pie to crack then bake your pie with an ovenproof casserole dish filled with hot water on the bottom oven rack, which will keep it from cracking. Remove the pie from the oven and allow to cool completely on a wire rack 2-3 hours or overnight, before serving. I’m not seeing the macros here… but the pie looks delicious!